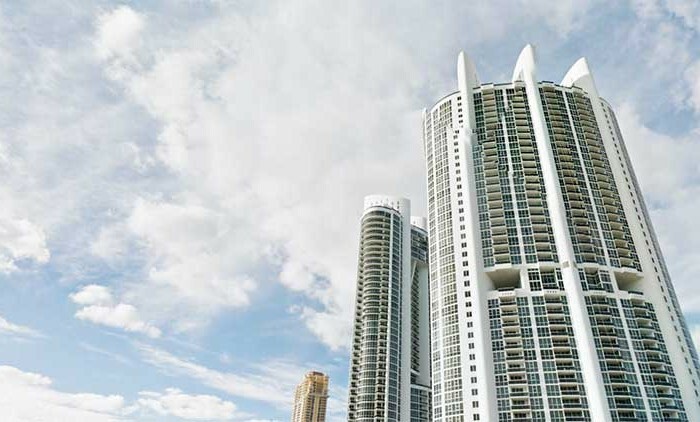 Ocean Three Condominium is a luxury oceanfront residential building located at 18911 Collins Avenue, Sunny Isles Beach Fl., on the beach side of the Atlantic Ocean between Ocean Two Condominium and the ultra-luxurious Armani Casa Residences. 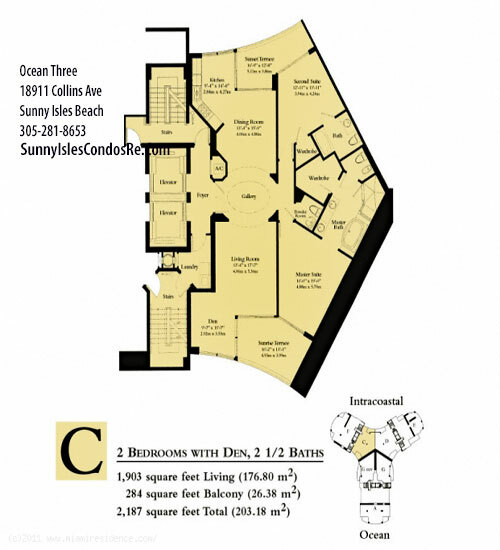 Enjoy open floor plan with residences from two bedrooms 2 bathrooms with 1,591 Sq.Ft. to four bedrooms 5.5 bathrooms. 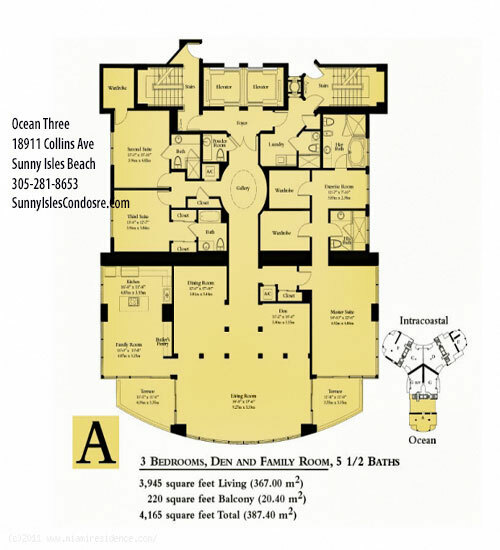 Units with spacious kitchen, semi-private elevators that open to a foyer, floor-to-ceiling glass windows for more natural lighting, master suites with his & her bath, large walking closets, large wraparound terraces. Ocean Three offers amenities like oceanside beach services like umbrellas, towels, chairs, heated pool by the ocean, rooftop Jacuzzi with 360-degrees of infinity Ocean, Intracostal and City views, 24-hours security services, valet, bistro, tennis court, three kids playgrounds, worldwide concierge, private storage room, library. 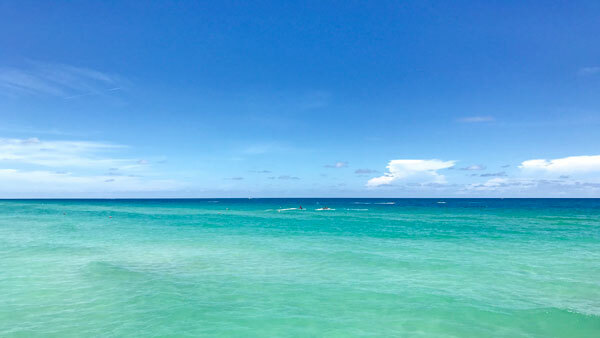 Enjoy the pristine beaches of Sunny Isles Beach, walk every morning to any of the oceanfront parks or have lunch at the famous landmark Pier of Sunny Isles. 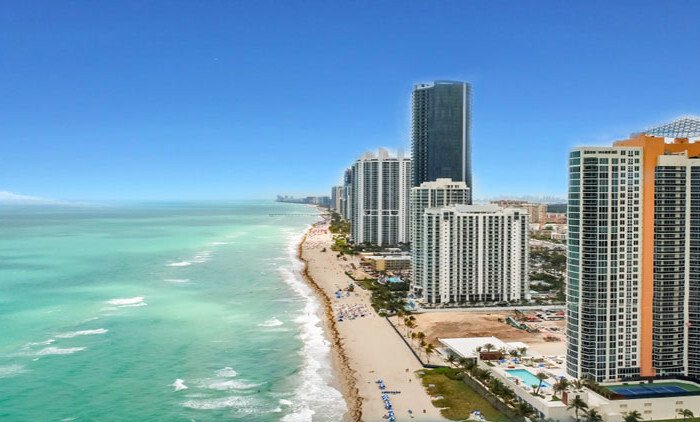 Sunny Isles Beach ideally located just a few miles north of the prestigious Bal-Harbour Villages and East to the affluent community of Aventura, where the famous Turnberry Isles Golf Course is waiting for your visit, only 30-minutes drive from Miami and Fort Lauderdale airport, close to the energetic and dazzling South Beach. 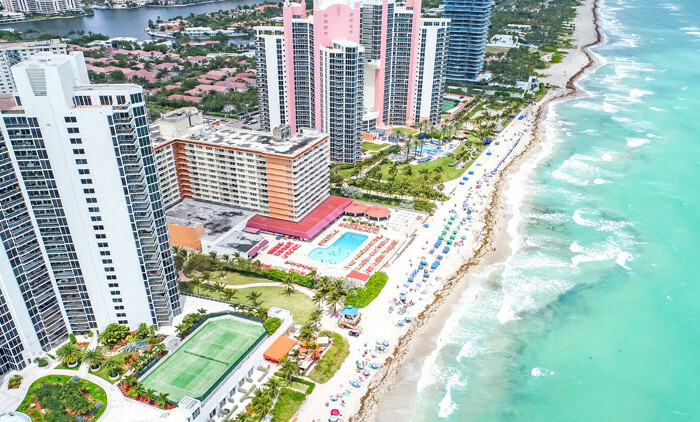 When you live in Sunny Isles you can enjoy many water sport; we are close to Haulover Marina, our kids can attend “Norman S.Edelcup” K-8 School, one of the best public schools in the Miami-Dade County. 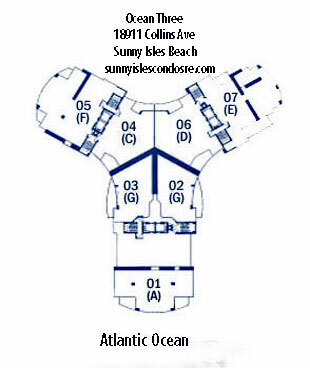 Whether you are looking to buy, sell or rent any real estate property in Ocean Three, Ocen Two, Ocean One or any other condominium in Sunny Isles Beach, www.SunnyIslesCondosRe.Com is here to help you, please call us today at 1+305-281-8653 or email us at ghrealtor18@gmail.com, it will be an honor to help you find your next home in South Florida. Unit A, line 1, 3BR+DEN-5.5 BH with 2,649 Sq.Ft. 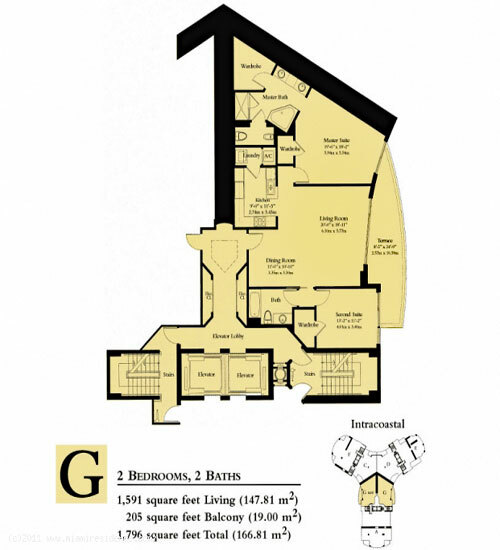 Unit G, lines 02 & 03, 2BR-2BH with 1,591 Sq.Ft. 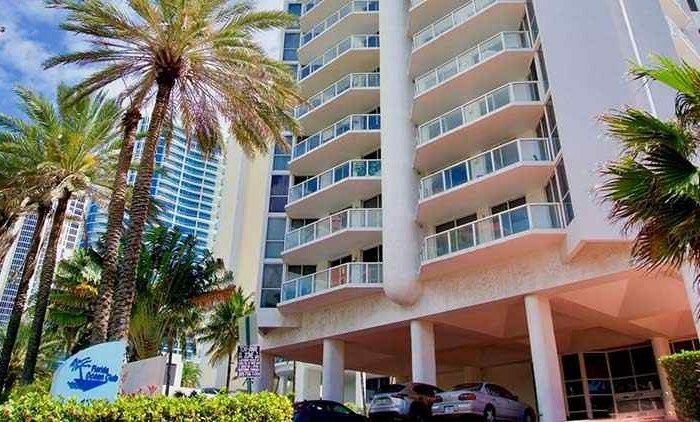 Unit C, line 04, 2BR+DEN-2.5BH with 1,903 Sq.Ft. 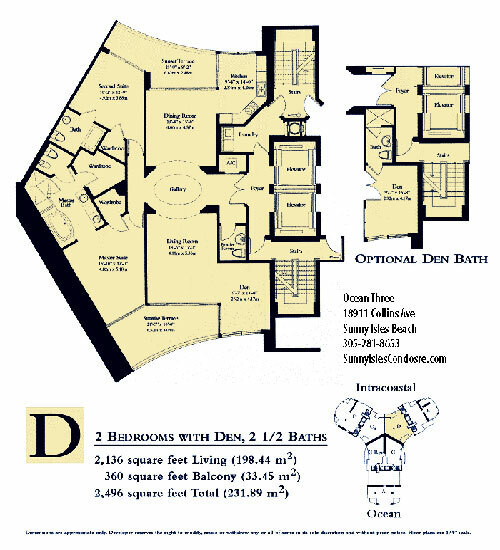 Unit D, line 06, 2BR+DEN-2.5BH with 2,136 Sq.Ft. Unit E, line 07, 2BR+DEN-4.5BH with 2,649 Sq.Ft.